Two currency pairs – Bitcoin Cash/Euro (BCH/EUR) and Bitcoin Cash/Czech Koruna (BCH/CZK), have been added to the exchange. Buying and selling Bitcoin Cash will have reduced fees until the end of the year. 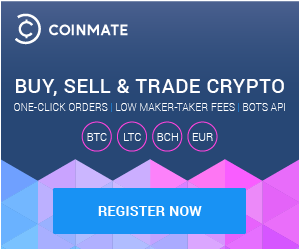 Coinmate is committed to improving our services long-term, and to support positive developments in the cryptocurrency industry as a whole. New currencies and more enhancements will be added in the near future.